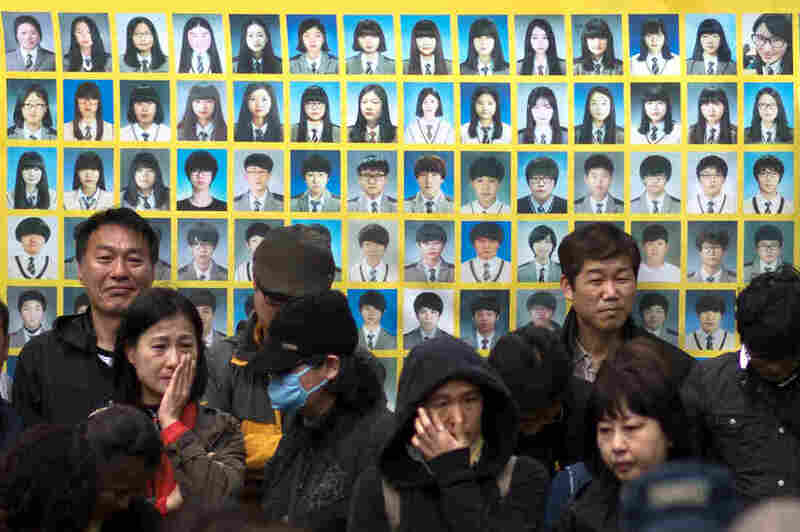 A Year After Ferry Disaster, South Koreans Await Answers : Parallels The root causes of the accident that killed 304 people are still unclear, and parents of the victims are embroiled in a political tug of war. As South Korea marks the first anniversary of one of its worst maritime disasters — the sinking of the Sewol ferry — many family members are still pushing for answers about what went wrong and why so many lives were lost. The capsizing of the Sewol on April 16 last year killed 304 people. Most of them were students from one high school. It's not hard to spot grieving parents in Seoul's central square: Their heads are freshly shaved. It's an Asian tradition showing determination, and the families have done it as part of their ongoing protest of the government response to the tragedy. About 70 parents who lost children in the Sewol sinking shaved their heads in mourning and protest. For weeks, they have marched, rallied and occupied Seoul's Gwanghwamun Square, the symbolic center of the city, pressing for the full and independent investigation South Korean President Park Geun-hye promised in the days after the ship went down. A year later, the investigation hasn't started, and the ferry still sits at the bottom of the ocean. "What is the government trying to do? I don't know what they're trying to do. All I can see is they're trying to hide," says Jeong Jung-im. This time last year, Jeong was sending the youngest of her two daughters, 16-year-old Kim Min-jun, on the Sewol for a school trip. A day and a half later, she and her husband learned the news that still haunts her. Kim was one of the more than 200 high school students who would never come home. "I can at least cry ... I have tears in my eyes," Jeong says. "But my husband, he can't even cry. The anger just piles up inside him." The captain of the ferry is serving jail time for negligence in abandoning the ship, and some incremental changes have been made since the disaster. Regulators tightened oversight of cargo loads, for instance, since prosecutors found the ferry capsized partly because it carried twice the legal limit of cargo on its final voyage. Relatives of victims of the Sewol ferry accident stand before a banner featuring victim photos during a protest. More than 300 people, most of them high school students, died in the accident. Nine people remain missing. But parents want an outside look at why rescue efforts took so long, what mistakes were made at official levels, and how lax enforcement might have played a role. "Accidents like this keep happening and will keep happening," says Ryu Sang-il, a professor of public safety at Dong-eui University in Busan. In South Korea, he says, high-speed economic growth trumps all other priorities. So a year later, it's hard to tell how much safety has really improved. And now, a bitter political back-and-forth has stymied efforts to heal the wounds. On one side are the Koreans who want more answers from the country's leadership. On the other side are people like Jang Gi-chong. He leads counter-protesters who show up in the same public square as parents, saying families are holding back the country and should go home. He and other counter-protesters oppose further investigation, saying the prosecution of the ship's captain and focusing blame on the ferry company owners is enough. "This problem, the Sewol incident, is definitely not an accident caused by government. To hold the government accountable for this? That's wrong," he says. Then there are the loved ones who have only one demand — closure. Nine victims — one just 6 years old — are still missing, their bodies never recovered. Lee Keum-hui's daughter is one of them. "When I think of my daughter, my heart breaks, because I think of how scared she must have been, how she must have cried out for me," Lee said, in an emotional news conference in Seoul. She and other family members of the missing say they're not pressing for reform, they just want the ship to be towed out of the water. "All I'm thinking about is I have to get her back. I know she's inside the Sewol ferry. So all I feel now is despair," Lee said. President Park said last week she'd consider raising the Sewol, but set no date for a decision. The price tag for ship recovery — an estimated $110 million — is clearly divisive, as well. There's also no start date for the outside investigation parents have pressed for, leaving those seeking answers struggling to move on. Hae Ryun Kang contributed to this story.